Having looked at Glasgow for a comparison on Compass, here’s another very instructive comparison, a bit closer to home. This op-ed piece appears in the Toronto Sun and is by R. Michael Warren who is a “former corporate director, Ontario deputy minister, Toronto Transit Commission chief general manager and Canada Post CEO”. He was present when the decision was made to buy “the province’s untested “Intermediate Capacity Transit System” (ICTS)” which we know as SkyTrain. Toronto Mayor Rob Ford has been on the wrong side of this issue longer than anyone. “Stopping the war on cars” to him means putting rapid transit below ground or making it grade-separated. Out of the way of cars. It seems to me that an endorsement by Rob Ford should be enough to deter anyone. But Vision Vancouver wants a subway under Broadway. And for very similar reasons. What is even more striking is the way that the link has been made in local planning for Grandview – where towers were suddenly added to the plan, much to the surprise and dismay of those who had been consulted. And one suggestion has been this is necessary to show that Vancouver is committed to increasing density (in the form of high rise towers) at subway stations. The quid pro quo being that if the City wants rapid transit then there has to be supporting denser land use. No repeat of what happened along the Expo Line – with no development happening at all at Broadway, Namaimo or 29th Avenue stations. By the way exactly the same effect was seen along the second subway in Toronto. The Bloor-Danforth line cannot be seen as clusters of towers around stations the way the Yonge line can be. It is also worth re-iterating that the idea that a subway can be inserted underneath an existing street without interfering with it is foolish. Sure cut and cover subways and surface light rail create disturbance all along the street, but subway stations are significant objects at major intersections and have to have connections to the surface. And despite the nonsense that was peddled by the Canada Line constructors, entrances are needed at all street corners, not just one of them. If only to handle transfers to other transit effectively. 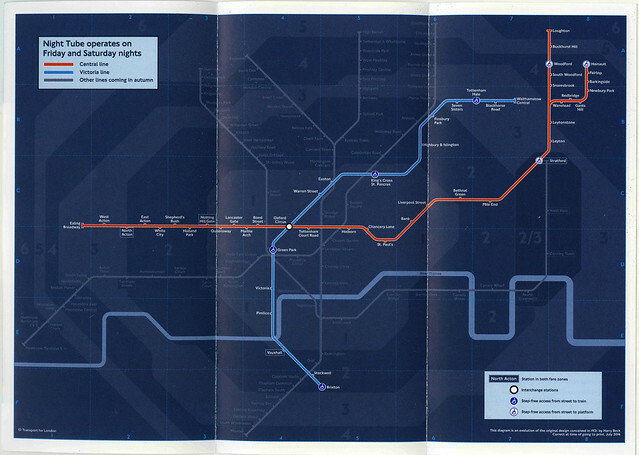 But also if you build very expensive subways, and you want fast services, there are going to be fewer stations – and most development is going to have to occur within a short walk of the station entrance. Do not think you can do that without upsetting the neighbours. Or you can have enough new development without increasing building heights significantly. To make the headline a bit clearer, politics is always going to decide how public money is spent on major infrastructure projects. There is no way this can decided simply by technical considerations. These are not engineering decisions. They are planning decisions. They are about place making. We have already plenty of experience of what happens to places when decision making is based on engineering standards. It is absolutely right that both politicians and communities get involved. The important thing is that the final outcome is not decided on short term political advantage. The Scarborough RT was supposed to have been extended north and then east from Scarborough Town Centre to serve a new area of affordable housing known as Malvern. But the route, protected from development, ran though a neighbourhood that got built before the line did. 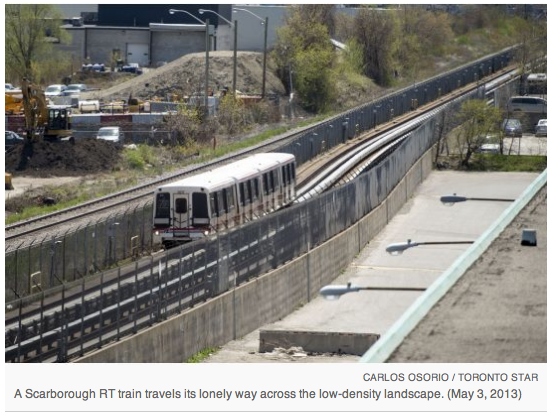 When the TTC got ready to start building the local politicians listened to the protests of the neighbours who did not want trains running past the end of their backyards. Malvern, by the way, is now one of the greatest concentrations of visible minorities in Toronto – and one of the poorer and most troublesome areas for crime and social problems. Which cannot be blamed on SkyTrain! What the headline means is that politicians tend to make decisions based on what is best for their party, or will be most popular with current voters. Politicians who act with an eye to the long term future are much rarer. But the decision to build the Canada Line underground beneath Cambie was based on those kinds of calculation. 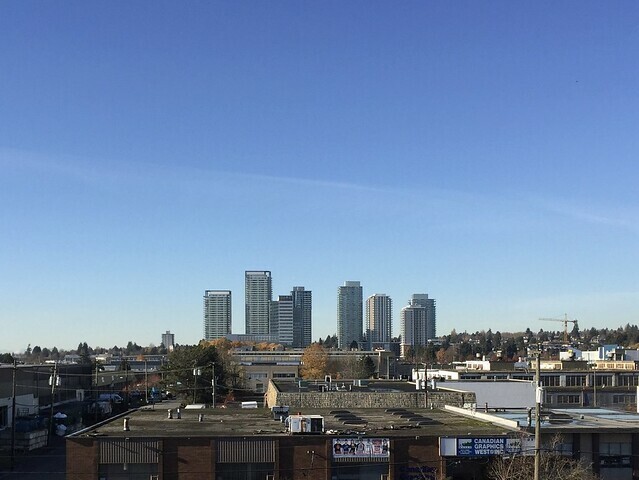 Or rather, the decision to refuse to consider light rail – either along the existing CP right of way in the Arbutus corridor or along the “heritage boulevard” of Cambie Street – was all about placating the existing voters, not about accommodating the people who were going to move to the Vancouver region. Or looking at something like “the best benefit-for-cost solution”. The CBC is reporting that not only will the Canada Line be turnstileless when it opens – so will SkyTrain for at least another three years. That is when a new smart card system might start to be implemented. 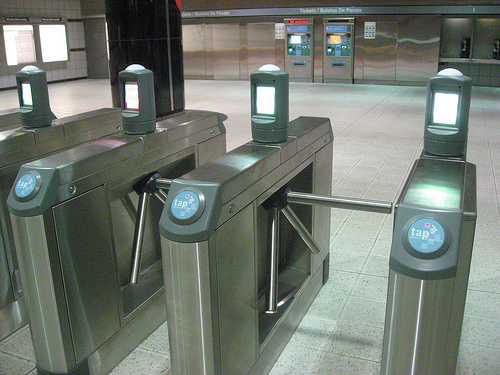 “We could see turnstiles starting to appear in the system by 2012,” Hardie told CBC News on Thursday. The turnstiles, regular readers will recall, were an obsession of the previous Minister of Transport Kevin Falcon. (He now overseeing the breaking of the election promise not to cut healthcare spending.) In his eyes turnstiles would eliminate crime on the transit system. It turns out of course that the two issues are not related. And even though Translink is strapped for cash, the turnstiles do not seem capable of doing much for cash flow either. They do not appear among the many revenue generating ideas that Translink has floated – but they will of course be a significant capital cost to introduce and a major addition to operating and maintenance costs if they are indeed installed. I suspect that if Translink does not get all of the new $450 m it is seeking, then this idea may well get quietly forgotten about. After all, since it will not actually increase net revenue and does nothing to boost ridership, then plenty of other ideas will take precedence – especially if there is no political pressure to make it happen. And that pressure to be effective these days will have to come from Victoria, and they are going to have a great deal more important things to worry about in three years time, when a lot of chickens will be coming home to roost. That does not mean necessarily that smart cards bite the dust either – but gates are not actually necessary with new technology. Indeed, for safety reasons, some systems with gates leave them open by default, and only close them if no valid media is present near them when somebody tries to get through. You can also use smart cards, proximity readers and mobile checkers in a gate free system and get very high levels of compliance – especially if the users have an incentive to use the readers, as they would with a fare by distance system. But that would require a complete reworking of the current system – which itself may or may not be worthwhile but is well beyond the scope of this post. It is with some reluctance that I open up, once again, the can of worms that is fare evasion and transit safety. I would not have done so had not the CBC once sandbagged me on air with an unexpected clip of a New York cop talking about fare evaders as criminals. Before you comment on this post you are required to click on the the link at the top and read the whole story in the New York times. There are also related links (the NYT understands how to use a web site now: it will take the Aspers years to catch up). It is desperately sad and my deepest sympathy is extended to the family, friends and coworkers of Edwin Thomas, who died trying to do his job. Paul J. Browne, the Police Department’s chief spokesman, acknowledged that while the department’s Transit Bureau has more than 2,000 officers dedicated to the subway system, there are none dedicated to buses except during operations like fare-evasion crackdowns. One such crackdown, which began on Oct. 22, has resulted in 86 arrests and 349 summonses, he said. That is because there are city police on the streets who can be summoned and get to the scene more quickly. All kinds of people evade fares for all sorts of reasons. They are not all hardened criminals, and their reasons for evasion range from indigence to an attitude that fare collection is a “game” they can win at. The right wing here likes to cite New York as an example for us to follow. The examples of zero tolerance and the “broken window” strategy are cited approvingly. Yet there are on average 89 assaults on New York bus drivers a year. Edwin Thomas did not seem to get much benefit from these policies. I am far from convinced that they would change much here. I also remain skeptical that introducing dogs will do much good either. There are plenty of people here who are extremely uncomfortable around dogs, both for cultural reasons and, even more sadly, bitter experience. There are far too many regimes that use police dogs to intimidate the populace in general. Not that I think Translink wants to do that – but (as Kelsey seems to be aware) some people may perceive it that way. But as always my theme is that barriers on SkyTrain will not do what their proponents claim. They will be an immense waste of money and a continuing drain on the system. Money that could be spent on better transit service, which gets more people on the system. Which is what makes people feel safe. But is also what we need to make this region more livable.